Finally, this ain't a rumor, guys! The real deal has been unveiled at last. 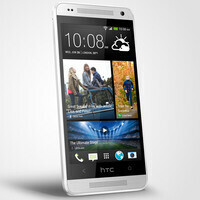 Meet the HTC One mini – a physically smaller version of the HTC One, aiming to pack as much cool as its larger sibling, but in a more compact, pocket-friendly package. So our guess is that you're wondering how small the new smartphone really is. And it is nice that we now have the exact figures. To start, the HTC One mini comes with a 4.3-inch, 720x1280 pixel display vs the One's 4.7-inch 1080p screen. At 122 grams, the new model is also lighter, all the while being made of machine-milled metal, following in the One's footsteps. The mini isn't much slimmer than the HTC One, however, with a thickness of 9.25 millimeters at its thickest point. Thankfully, the HTC One mini's tapered sides should at least make it feel much slimmer than it is. The HTC One mini has its processing punch delivered by a dual-core Snapdragon 400 SoC with a processor clocked at 1.4GHz. Of course, that's not as potent of a chip as the Snapdragon 600 fitted inside the HTC One, but we doubt that the smartphone's performance would disappoint. 1GB of RAM is on board, which is still okay for a mid-range device, although another gig would have been more than welcome. HTC has chosen to put an UltraPixel camera with a 1/3" sensor size on the One mini, whether we like it or not. Our guess is that the snapper's performance would be close to that of the HTC One's camera, although there's one notable feature that has been omitted in the mini's case. In particular, the HTC One mini does not have optical image stabilization. What the UltraPixel camera does have in its feature set, on the other hand, is 1080p HDR and slow motion video recording. On the front side of the device is embedded a 1.6MP front-facing cam. And speaking of its front, the HTC One mini has adopted the One's frontal stereo speakers. Moreover, each of them has its own dedicated amplifier, delivering rich, clear, distortion-free audio. Naturally, Beats Audio is on board with its clever audio enhancement tech. If having a microSD card is a must for your needs, then you might want to look away now. While the HTC One mini does have 16GB of on-board storage, which is still alright, there is no way of expanding it with a microSD card. The built-in, non-removable battery has an okay, if not rather small-ish capacity of 1800mAh. As for the software part of the equation, the HTC One mini will come running Android 4.2, which is the newest version available to date. The interface will be heavily modified, of course, by layering the HTC Sense UI on top of it, presented in its latest form. HTC BlinkFeed will also be on board, instantly providing the user with relevant information from social networks and across the internet. The HTC One mini is projected to launch in select markets in August and we sure hope it won't face any delays as the One did. Then in September, the smartphone should become available globally. At this time, only two color variants of it have been announced, named Glacial Silver and Stealth Black. Pricing has yet to be specified. London, July 18, 2013 — HTC, a global leader in mobile innovation and design, today announced the HTC One mini, a compact version of the award winning HTC One, which has redefined the smartphone experience with revolutionary technologies including HTC BlinkFeed™, HTC UltraPixel Camera™ and HTC BoomSound™. Exchange (TWSE: 2498). For more information, please visit www.htc.com. For more information on HTC BlinkFeed’s content partners, visit the HTC Blog. I prefer Xperia ZR and SP than this!!! Problem with both those handsets is display. Its very poor compared to the SLCD3 on this phone. The only problem i see on the display on those two handsets from sony is the viewing angles and everyone make a very big deal out of it. . . . I (personally) think that viewing angles is the stupidest thing they can compare between smartphones. People say "that works when you want to show something to your friends". I don't buy a friking phone to "show things to my friends, I buy it to use myself. Are you ALWAYS looking at a 160° ?? The only problem i can see with this is 1800mAh battery. 16 Gb isnt enough for me either, i need 32. I still have 11Gb left of my 32Gb phone. So, 32 is more than enough but 16 is insufficient. Battery life is horrible on this thing and still no SD CARD. And youre right the ZR is better than this thing. Good looking but not enough competition to the Nexus 4. What's your point? Its a mid range device. It isn't made to compete with the Nexus 4 which is a high experience device. True... However Its probably going to be priced the same as the Nexus 4. Hence the comparison. Price is what ultimately decides it for the consumer. The S4 mini has 1.5 Gb. It will surely be overpriced. Xperia ZR is the best downgraded phone over Xperia Z with compromise only on screen, internal memory and design. Look at the Samsung GS4 and GS4 mini, adding this HTC One to HTC One mini. I think the ZR isn't exactly a downgraded variant of Z. It's more like a variant of Z with lower res smaller screen, lower memory, and worse design and adding more water resistance. Usually a downgraded phone will have worse processor. Huawei? No thanks. I dont need extra spying from China after the USA. /s But seriously, i will never consider Huawei, or ZTE.